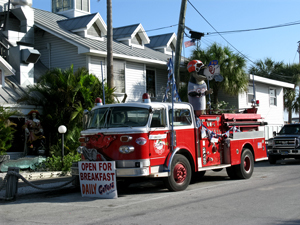 Gators Cafe at Johns Pass on Treasure Island FL, sometimes known as Gators Beach Bar, is great for breakfast. I ate there last Saturday while I was over by Johns Pass Village taking pictures for a future Blog entry on the bridge construction which has frustrated locals for the past 3-1/2 years. 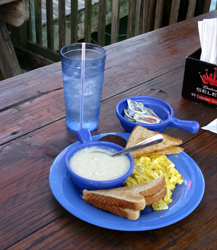 Although Gator's is primarily known for its high-energy contribution to Treasure Island Nightlife it is a nice place to have a quiet waterfront morning meal for a great price. There are several different levels of decking on the water side and you can get great views back into Boca Ciega Bay. Both private and commercial boats are heading out to fish in the Gulf...but the beauty of watching them cut through the Pass is pretty much negated by the rusted construction barges and huge oily cranes. Opening at 7:00am, Gators Cafe offers a full breakfast menu with excellent choices. Actually, I couldn't believe the variety of menu items. I got here about 7:30am and had the entire outside deck to myself. Even though there was construction going on a hundred yards away, it was noiseless and I could actually hear birds calling as I watched the sun come up on Boca Ciega Bay. A time like this definitely makes you feel thankful for living in such a Florida beach paradise. The quiet water, the fresh sunlight and the cool morning breeze put you in a peaceful state of mind that helps carry you through the rest of the day. I ordered a basic, vanilla breakfast of two scrambled eggs, 2 sausages, grits, and wheat toast...all for under $5. It seemed like it was on my table three minutes later. What I got looked like three ostrich eggs, moist round sausages, and a huge bowl of grits. This is not what I expected from a Treasure Island bar. Talk about getting stuffed. I was feeling full with two pieces of toast and a sausage left. Everything was cooked to perfection and I didn't have to eat again until about 2:00pm. I will definitely make this a regular breakfast stop. Gators Cafe has suffered from the prolonged construction mess surrounding completion of the new Johns Pass Bridge. The morning waitress told me that there are far less families coming to the bar because people do not want to deal with the slow, long lines between Madeira Beach and Treasure Island . 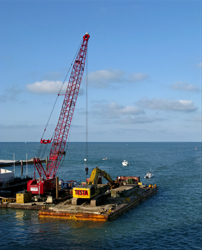 Plus, when they get here, the Pass is jammed with huge, rusty pieces of construction equipment that spoil the atmosphere of the beautiful inlet. The staff at Gator's doesn't gripe about the construction even though completion is a year behind schedule. They've chosen to look positively at it as a time to expand weekly events and promotions. Although Gators is far-better known for its Sunday $1000 Bikini Contests, Ladies Night, and Beer Pong... people are missing out by not having breakfast here. As I was leaving, two young couples from Connecticut were coming in. I'm hoping their morning experience was just as pleasant as mine, and they get the word out.